WATERTOWN – As Anwar Souini describes it, he was browsing the North African section in a Central Square record store in Cambridge one day in 2006, when he came across a CD that intrigued him, by a group called Atlas Soul. That the shop even had a North African section was refreshing for Souini, who left Morocco to study in the United States in 2001, arriving at the University of Wyoming, of all places, a few weeks before 9/11. “I wasn’t lucky,” Souini says of the timing. Lonely and isolated in Wyoming, he had moved to Florida after two years, before finally landing in Boston — a place where, he found to his relief, many people had at least heard of his home country. Better yet: After listening to Atlas Soul and enjoying its unexpected mix of North African music with funk and jazz, Souini — an accomplished singer who had recorded in Morocco as a teenager — noticed the CD listed a contact number with a Boston area code. That “he” was Jacques Pardo, Atlas Soul’s saxophonist and leader, a longtime figure on Boston’s world music scene who cofounded the group in 2000 with Moroccan brothers Lotfi and Majid Tiken, after leading a predecessor act called Cosmos Factor. 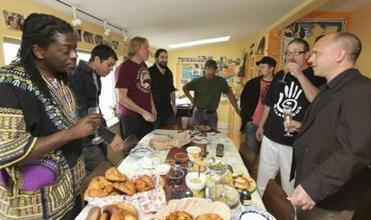 Band members and friends have a brunch before a jam session. Pardo hired Souini as the group’s lead singer at the same time that the Tiken brothers were leaving for other projects. Now, after six years and some more personnel changes, Atlas Soul is an eight-member band with three self-released CDs. The fourth will be out this summer; they’ll preview the new songs Saturday at Regattabar. They continue to blend North African music, primarily the raï and shaabi styles, with jazz, reggae, and more. Chicago-raised Regie Gibson, a recent addition, brings a hip-hop element, rapping in poetry-slam style over crisp funk grooves. It’s an eclectic crew, mixing immigrants and locals — trombonist Jon Simmons and guitarist Pericles (Perry) Bakalos are Boston guys — with songs in Arabic, French, and English, though snippets of Hebrew and Italian also creep in. 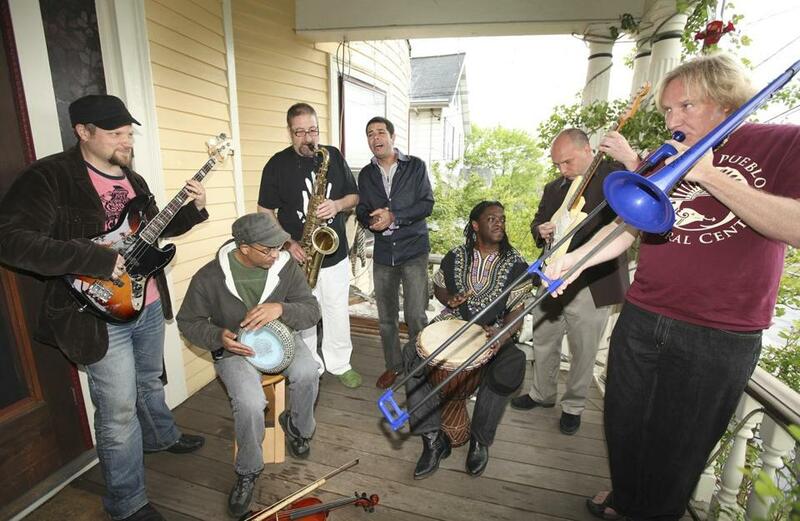 This makes for a wacky, polyglot family feel, much in evidence when a photo shoot with seven members (drummer Nadjim Kebir was on family business in Algeria) turns into a brunch and jam session at Pardo’s home, with his wife, Sarah, their adult daughter Maya, sound engineer Graham Tobias, a dog and a cat all in attendance. Pardo’s personal history reflects some of the strands in Atlas Soul’s cultural explorations. A “wandering Jew,” as he describes himself, from a French Sephardic family with roots in Greece and Algeria, he studied music in a French conservatory. He then decamped to Japan to study Zen and karate, but decided music was the stronger calling. Along the way he bought land in Israel and lived there a while, before putting down roots in Boston. Boujemaa Razgui, who has been with Atlas Soul from the beginning, is another nomad who settled here. A native of Marrakech, he left for Spain in 1985, then immigrated to Canada before getting married and moving to Boston in 2000. Gibson, meanwhile, brings an American flavor and a way of communicating with the audience that Pardo says he especially appreciates. Atlas Soul’s disparate influences are on display in their new songs: those inclined to dissect will hear klezmer and raï on “Gypsy Wind,” shaabi on “Maleh,” or 1970s funk on “This Won’t Take Long.” There’s also a jazz standard, “Harlem Nocturne,” which Gibson sings in English and Italian while Pardo stretches out on a saxophone solo. With fresh material and band members who clearly thrive off each other’s company and ideas, one could say Atlas Soul is going strong. The band has a devoted local following, and Pardo says their music gets frequently downloaded by listeners in Morocco, Algeria, Egypt, and France. At the same time, the group’s exposure has yet to match its talent. That’s partly in the nature of a band where everyone holds down a day job, and where the large number of players makes travel costly and cuts down individual shares of concert fees. Still, Pardo is happy that Atlas Soul has been able to play its small part in bridging cultural differences, as evidenced by the mix of ages and origins he has seen over the years at their shows.